The HondaJet cockpit and avionics system will be one of the most updated light jet category. 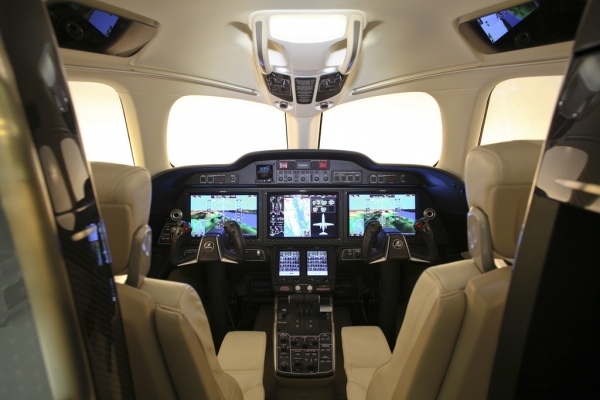 The Hondajet will be one of the aircraft to future the newer Garmin G3000 Avionics. Honda was originally going to use the Garmin G1000 avionics suite to power the cockpit on the HondaJet, however when the Garmin G3000 came out Honda decided to switch to the new avionics from Garmin. The cockpit will future two primary flight displays (14 inches), one central multi-function display (14 inches), and two radio/navigation displays. All displays will have touch screen capabilities. Currently, the HondaJet's Avionics will be one of the best in the category with the Garmin G3000, due the systems advanced capabilities and touch screen interface. We will provide updated information about the HondaJet's avionics and cockpit as new information becomes available. Be sure to visit the other Hondajet aircraft information pages to learn more about the HondaJet.